Lyra Research announces the release of a series of reports on Print Usage and Purchase Requirements among SMEs in Five European Countries. The reports are based on Lyra's 2008 survey of small and medium-size enterprises in France, Italy, Poland, Turkey, and the United Kingdom. The survey profiled office printer technology and investigated user perception regarding printing and technologies. The reports include findings on demographics and printing behavior; purchase intentions, preferences and channels; color use in the office; perception and preferences regarding ink jet and laser devices; supplies usage and purchase levels; and identification of sales opportunities. Lyra Research, the digital imaging authority (http://www.lyra.com), announces the release of a series of reports on Print Usage and Purchase Requirements among SMEs in Five European Countries. The reports are based on Lyra's 2008 survey of small and medium-size enterprises (SMEs) in France, Italy, Poland, Turkey, and the United Kingdom. The survey profiled office printer technology and investigated user perception regarding printing and technologies. The reports include findings on demographics and printing behavior; purchase intentions, preferences and channels; color use in the office; perception and preferences regarding ink jet and laser devices; supplies usage and purchase levels; and identification of sales opportunities. Included in the report series is the five-country report--Print Usage and Purchase Requirements among SMEs in Five European Countries--and the following single-country reports: Print Usage and Purchase Requirements among SMEs in France; Print Usage and Purchase Requirements among SMEs in Italy; Print Usage and Purchase Requirements among SMEs in Poland; Print Usage and Purchase Requirements among SMEs in Turkey; and Print Usage and Purchase Requirements among SMEs in the United Kingdom. a comparison of Lyra's survey results to the overall industry representation for each country, based on NACE categories, including agriculture, construction, education, finance, manufacturing, real estate, and retail trade, among others. Commenting on the report series, Larry Jamieson, director of Lyra's Hard Copy Industry Advisory Service, said, "These reports are ideal for decision makers at printer, copier, and supplies companies who are eager to better understand printing behavior among SME offices in Eastern, Southern, and Western European countries. They deliver insight into office printing applications, supplies use, channel preferences, and future purchase intentions, making it easier to identify opportunities within the SME market. While vendors that were early entrants into these European countries have established strong positions, solid sales opportunities will emerge for vendors that are best able to gauge SME user requirements and preferences when the current global economic crisis begins to improve." 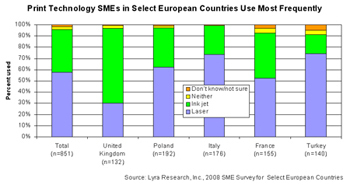 Lyra's survey of SMEs in France, Italy, Poland, Turkey, and the United Kingdom reveals that some printing aspects are universal and there are very few differences between businesses in the countries, but other attributes vary widely. For example, the United Kingdom has the largest number of SMEs with respondents that cite ink jet as the most frequently employed technology (66 percent). Laser is heavily used in Turkey (74 percent), Italy (73 percent), and Poland (62 percent), while France has the closest balance between laser and ink jet. Fifty-two percent of SMEs in France employ laser and 42 percent use ink jet as their primary print technology. The differences between the countries represent both challenges and opportunities for vendors. Those that are able to identify and target these factors will have the best chance for success. To learn more about print usage and purchase requirements among SMEs in France, Italy, Poland, Turkey, and the United Kingdom and the report series, go to http://lyra.ecnext.com/coms2/summary_0290-1008_ITM. The Print Usage and Purchase Requirements among SMEs in Five European Countries report is available for immediate purchase at a cost of $1,995. The single-country reports -- Print Usage and Purchase Requirements among SMEs in France, Print Usage and Purchase Requirements among SMEs in Italy, Print Usage and Purchase Requirements among SMEs in Poland, Print Usage and Purchase Requirements among SMEs in Turkey, and Print Usage and Purchase Requirements among SMEs in the United Kingdom -- are also available for immediate purchase at a cost of $995 per report. The five-country report plus the five single-country reports are available for $4,995 (a $1,975 savings). For an additional $2,500, report buyers have the opportunity to purchase a live presentation of the data covered in these reports and two hours of analyst inquiry time. Each report is delivered in PDF format, based on PowerPoint slides. For more information about report purchase options, please contact Sandy Tobin, client relations manager, at 617-454-2612 or stobin(at)lyra.com, or visit Lyra's online store at http://lyra.ecnext.com/coms2/summary_0290-1008_ITM. Sign up now for Lyra's new European Market Research Brief, which features forecast information and primary research data related to the European digital imaging industry. The research brief will be sent out approximately every quarter. In addition, special bulletins will be distributed that contain information regarding Webcasts and events related to the European market. To update your profile and add your name to the mailing list, click here http://visitor.constantcontact.com/d.jsp?m=1101693414919&p=oi and enter your e-mail address. Instructions that explain how to join this list will be e-mailed to you. Lyra's Hard Copy Industry Advisory Service (IAS) provides forecasts, research studies, ongoing consultation, product specifications, advertising, and reference information for detailed analysis of the printer and digital copier markets, from low-end ink jet and laser printers to high-end production printers and copiers. Staffed by the most experienced team of printer analysts and researchers in the industry, the IAS provides actionable data and advice to help clients make vital industry-specific decisions and manage their businesses effectively.